1. What are the courses offered by Nagindas Khandwala College? We offer undergraduate courses like B.Com., B.Com. (Accounting and Finance), B.Com. (Banking and Insurance), B.Com. (Financial Markets), B.A., B.Sc. in Information Technology, Computer Science, Micro Biology. We offer Post Graduate Courses like M.Com. (Management), M.Com. (Accountancy), M.A. (Geography), M.A.(Economics). These courses are affiliated to University of Mumbai. 2. What are the minimum requirements for applying to a suitable course? 3. Where can I get the prospectus and application forms? 4. Do you offer a distance education programme? We do not offer a distance education programme affiliated Mumbai University. 5. Is there any agent who can help me in getting admission to your college? No, we don’t have any agents or middlemen for admissions. 6. Can I take back the original School Leaving Certificate? The original School Leaving Certificate can never be given back. 7. Are marks of the qualifying exams are considered for admission? All admissions in first years of junior and Degree College are strictly done on merit. 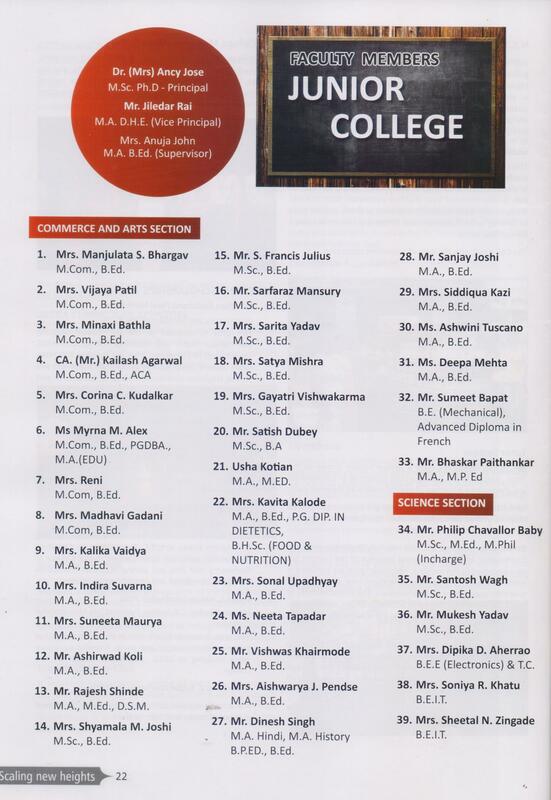 Preference of admissions to FYBCOM/BA is given first to our in-house students as per Mumbai University guidelines. Remaining admissions are given to outsider students strictly on merit basis. 8. Can I apply after the last date for submitting the application? 9. Is there any dress code? 10. What about placement after completion of course? We have the Placement Cell in our institution.